Home > Medicines and Vitamins > What Medicines Are Safe for Babies to Have? As a parent, it’s only natural to worry about the health and safety of your baby. When they’re unwell, you want to do your best to make them happy and healthy again, but it’s confusing knowing what you can and can’t safely give a young baby. We explore the practicalities of what medicines are safe for babies to have. Some of the common reasons why babies may require medicine is if they’re badly suffering from the discomfort of teething, if they have a cold, cough or fever, or an upset stomach. In the first instance, and if you’re unsure why your baby is unwell, then it’s always advisable to see a doctor. Not only will they be able to offer insight into a diagnosis, but they’ll also be able to give you up-to-date advice about how you can treat your baby and what medicine, if any, they require. On occasions where the symptoms are mild, you may want to treat your baby yourself, or following advice from a pharmacist. In these instances, over-the-counter medicines are usually used, but you should carefully purchase over-the-counter medications, with advice from a pharmacist, as not all medications are suitable for young babies. Due to their tiny size and age, babies are a lot more susceptible to the ingredients and, if the wrong dose is given, they can be put at risk of an overdose. In 2008, attention was drawn to cough and throat medicines aimed at children under the age of two, as the Medicine and Healthcare Regulatory Agency called for six well known products to be removed from the market and banned from being sold to parents with children under two years old. They contained 12 ingredients that caused concern, namely – guaifenesin, ipecacuanha, phenylephrine, pseudoephedrine, ephedrine, oxymetazoline brompheniramine, chlorphenamine, diphenhydramine, dextromethorphan, pholcodine and xylometazoline. What Medicines Can You Give to Your Baby? Guidance from medical professionals suggests that parents can safely give children's ibuprofen (or Nurofen) or paracetamol to babies under the age of two years old. These medicines can be used to help deal with the pain of teething and help lower the temperature of a baby if they’re suffering from a fever. Where babies are suffering from a cold or chesty cough, then there are various remedies you can try, such as saline nose drops or vapour rubs. 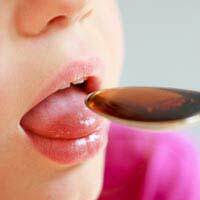 Some natural cough mixtures, honey and lemon that you can make yourself, can be used to aid tickly coughs; do be aware though that it’s not recommended to use pure honey on its own in babies under the age of one year old. How Can I Be Sure Which Medicines Are Safe? If you’re under any confusion as to which medicines can safely be used with babies, and which can’t, especially if you have already have medications at home that have been used to treat older children, then always look carefully at the instructions on the bottle or packet. They should provide clear information about what age they can safely be used with and the correct dosage information. There are a lot of different baby medications on the market, with different brand names, so always follow the instructions on the individual product – don’t rely on the assumption that it will be okay as another similar product has been. If you’re in any doubt, ask a qualified pharmacist or check with your doctor.